Conservationists from the Wildlife Conservation Society, the American Museum of Natural History, and other conservation and research groups have discovered that groups of dolphins in the western Indian Ocean do not mix freely with one another. In fact, dolphin populations are kept separate by currents and other unseen factors. 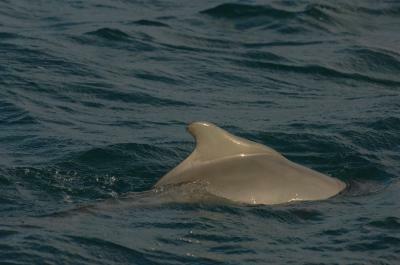 Specifically, the researchers have found that genetically distinct populations of the Indo-Pacific humpback dolphin may be formed in part by currents, surface temperature differences, and other environmental barriers, a finding made possible by using both genetic data from dolphins and environmental information from remote-sensing satellites. This is an Indo-Pacific humpback dolphin from the coastal waters of Oman, a country on the southeast coast of the Arabian Peninsula. Researchers from the Wildlife Conservation Society, the American Museum of Natural History, and other partners have examined how currents, temperature differences, and other environmental factors influence populations of Indo-Pacific humpback dolphins in the western Indian Ocean. They used remote-sensing data from satellites to inform genetic comparisons of different dolphin populations. 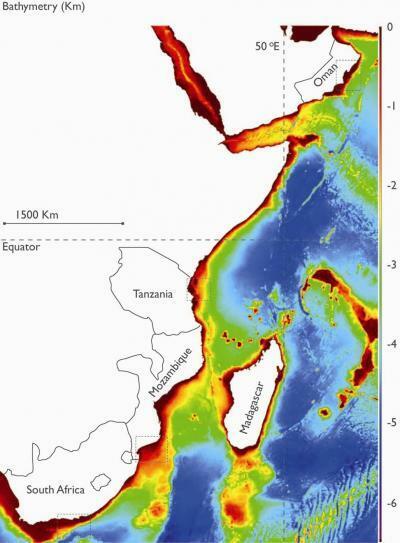 Researchers used environmental data from remote sensing satellites (such as ocean depth in this figure) to examine the genetic distinctiveness of dolphin populations located off the coasts of Oman, Tanzania, Mozambique, and South Africa.